In 2016, the charity Tipping Point held a seminal conference on climate change at Warwick University, entitled Doing Nothing is Not an Option. The long-term aim of the charity was to bring together scientists and artists on the issue of climate meltdown. The scientists would impart the facts, the artists would be the communicative interface between brutal fact and communal behaviours, seeking to bring about change. The mood of this conference was depressed; some of its leaders were suffering depression. The scientists had told us all we needed to know, the artists had been hard at work, nothing had changed. Action had proved futile, despite such dedicated commitment from so many individuals. The talk on the first day was, however, all about practical solutions to the impending catastrophe. Many strong women delegates present began talking about the need to work on a spiritual level. To ask the question, why are we living in this state of disconnect? We argued that until this was addressed, nothing fundamental would change. And, what is more, we didn’t like to be told what to do. So in the opportunity for a breakout group, one delegate said she was setting up a session entitled Doing Nothing IS an Option! She admits it was bolshy rather than measured, and when her small group got together in one of those small breezeblock cells that form modern university seminar rooms, they weren’t entirely sure what to do. So they sat. In silence. And as they sat, a prism appeared on the wall. 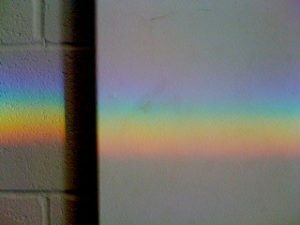 A long band of intense rainbow – who knew from where – and it shone on the wall for as long as they sat there. It was an enormously powerful message; by the end of the conference we were all using language such as ‘a new spiritual paradigm’. Extraordinary! For me, this is the key to how the imagination can act effectively, without depression, burnout, or despair. To do what one must do, without any attachment to the results or outcome. The picture is so vast we are merely pixels staring at pixels; the rest is beyond our focus, out of view.